Ta da! 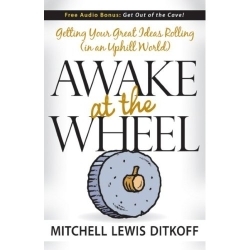 After seven years, 22 rejections, multiple rewrites, 2 agents, and a whole lot of looking at myself in the mirror, here it is: the publication of my new book, AWAKE AT THE WHEEL: Getting Your Great Ideas Rolling (in an Uphill World). Part fable, part creative thinking toolbox, the book is a wake up call for all aspiring innovators -- a simple way to help people "get out of the cave" and manifest BIG ideas in a world not always ready for the new and the different. If you have an inspired idea that is lingering in your mind and needs a fresh jolt to see the light of day, this book is for you. Tim Gallwey: "A superb catalyst for anyone with the urge to bring their best ideas into reality." Donna Fenn: "Og may have invented the wheel, but Mitch Ditkoff has created a GPS for the innovation process. Awake at the Wheel is a witty and inspiring roadmap for the journey from ideas to invention." Jay Conrad Levinson: "Nothing is as powerful as an idea whose time has come. The time has come for this book and Mitchell Lewis Ditkoff has put it into words. He has done a masterful job." Jack Mitchell: "Go ahead and 'hug' your employees by giving them Awake at the Wheel and creating a company culture that fosters, develops, and celebrates the best of their ideas." Joyce Wycoff: "A highly accessible alchemist's stone for aspiring innovators." Melinda McLaughlin: Awake at the Wheel illuminates! It's the perfect book for those of us who have felt the excitement of the 'aha' moment only to experience the frustration that comes when no one sees the brilliant lightbulb above our head. Mitch Ditkoff takes us on an engaging journey that re-imagines how to turn an idea into great success and makes it suddenly seem easy.? Chuck Frey: "Entertaining and inspiring."